In response to public interest and in support of significant national activity in the next few years, Royal Mail will issue the first in a series of three miniature sheets to align with Remembrance Day in 2006, 2007 & 2008. 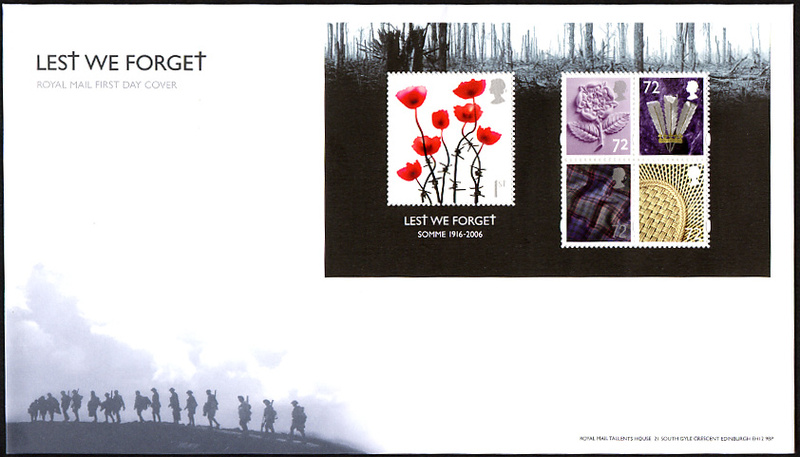 The first sheet in the series will be issued on the 9th November 2006 to commemorate the 90th Anniversary of the Somme. 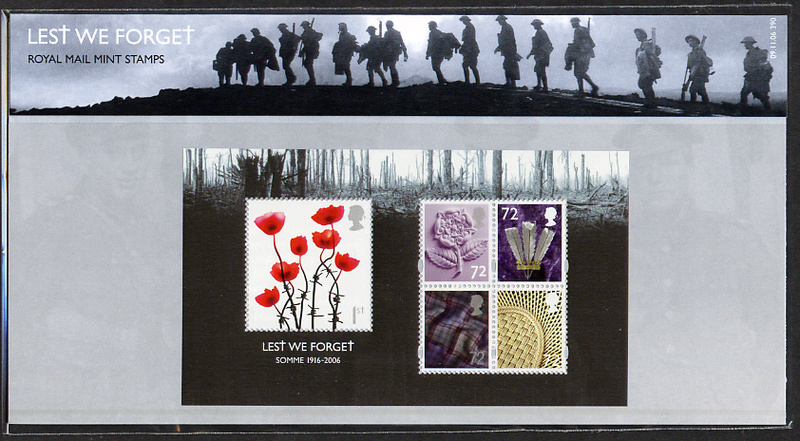 In 2006 there are various commemorations of the Battle of the Somme 1916, including commemorative events at the battlefield, and exhibitions at the National Army Museum as well as an online exhibition from the Imperial War Museum. The special national commemorations are specifically planned as we approach the 90th anniversary of the Great War rather than the traditional 100 year anniversary. 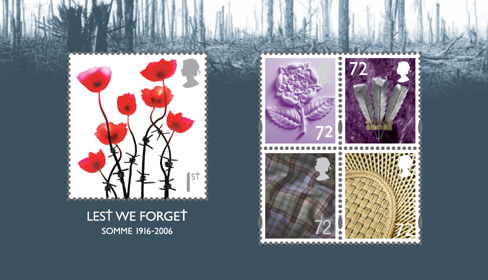 The Miniature sheet features one new special stamp showing poppies on stems of barbed-wire stems against a white background, plus a block four 72p country definitives, one for each of the countries of the UK. The minsheet will be printed in Gravure and as such is the first Northern Ireland country definitive to be printed in Gravure. The sheet is designed by hat-trick design and printed by De La Rue Security Print in gravure. The background photo is from the Imperial War Museum collection. 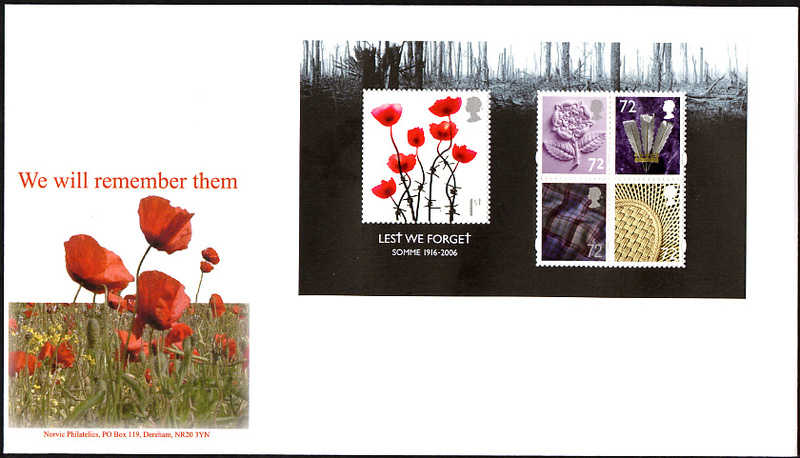 The Poppy stamp is perforated 14½x14 and the definitives 15x14. The sheet size is 124x71 mm. Stamp and postmark images are Copyright 2006 by Royal Mail; other images are copyright Norvic Philatelics. 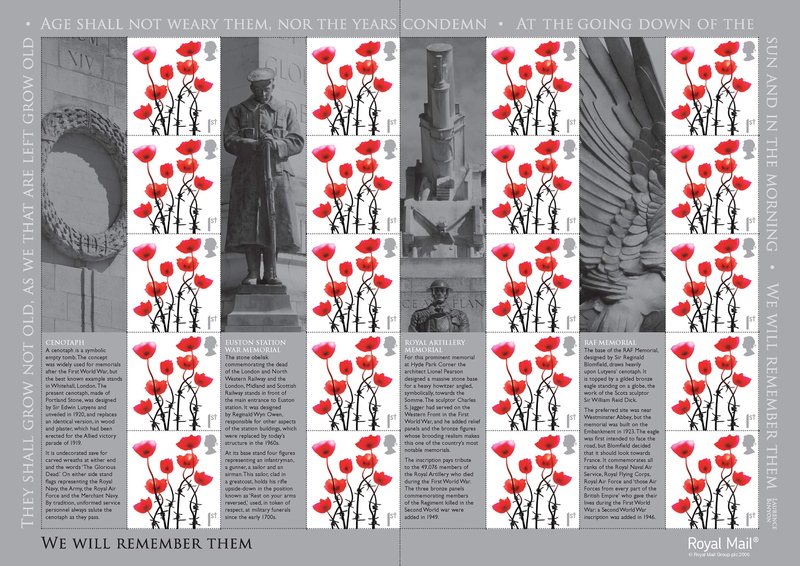 A generic sheet consisting of 20 x 1st class poppy stamps will also be available, designed by hat-trick design and printed by Cartor Security Printers. The title of the sheet is taken from the poem, "For the Fallen" by the First world war poet Laurence Binyon. Extracts from the poem also appear in the border of the sheet. 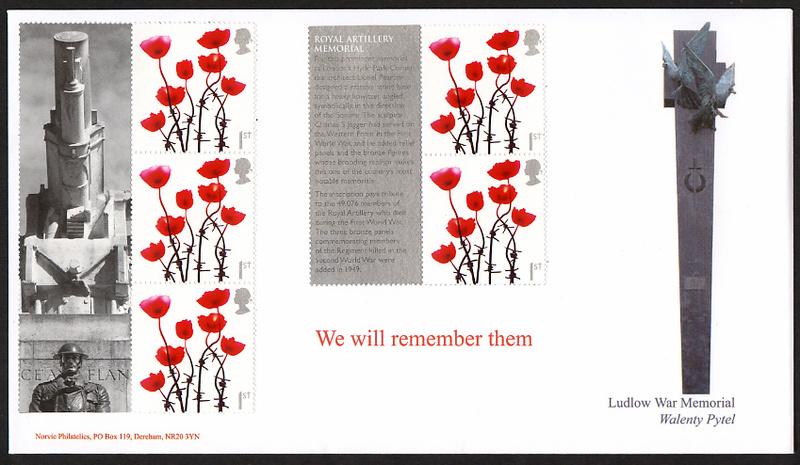 The labels next to the stamps show four war memorials: Lutyen's Cenotaph in Whitehall, Lionel Pearson's Royal Artillery Memorial at Hyde Park Corner, the RAF Memorial on the Embankent in London, and the railwaymens memorial at Euston Station to the dead of the London & North Western Railway and London, Midland and Scottish Railway. Information on each memorial is shown on the lower two 'labels'. Now that we have the actual sheets we can report that the 'labels' are not separately perforated, that is, the description and memorial image form one complete label the equivalent of 5 normal labels, as shown more clearly on the enlarged image. The sheet borders and description 'labels' (but not the memorials) are printed with silver ink. These sheets require very careful handling as the silver ink rubs off! Click on the image to display a larger one in a new window. Conflicts of the 20th century, The Cenotaph, Whitehall. If you wish to receive an email when this page is updated, please e-mail us.